This semester, I’ve been working with Dr. Kenton Ross, the national science advisor at NASA DEVELOP, to understand the spectral properties of Alexandrium monilatum. I am using aspects of this work as my term project for GIS 295 and GIS 255. In Harmful Algal Blooms – Part 5: Trouble in Data Land, I discussed the challenge of completing a mapping project when the data has lost its geospatial reference. However, we were able to obtain approximate locations for each hyperspectral scene by estimating pixel size and lining up the time field in the hyperspectral data with the time field in the the flight path data set. You can see the scene center lines in black on the image below. The water in this map looks unusual. NDVI is a band ratio index used to indicate vegetation. I used ((Landsat 8 band 5 – band 4)/ (band 5+band 4)) to mask out the land in ArcGIS. I then clipped out the unmasked water and used false color imagery (bands 6, 5 and 4) to enhance different features of the water. The water on the right side looks thick and yellow because it is very turbid. Once I knew where each scene was located, I analyzed each hyperspectral image individually. This is York scene 5. The first thing I noticed was that any detail was hard to see. That’s because one side is in shadow. So, I clipped out the black edges and the bright, overly illuminated right side of the image. I also reduced my number of bands from 283 to 13 carefully selected bands in order to reduce noise and maximize the spectral signal. The resulting image is in the slide below. The deep red swirl is the algal bloom. I used bands 146 (710 nm), 128 (665 nm) and 85 (559 nm) to create a NIR, red, green false color composite to highlight areas with high chlorophyll. That’s the second image in the slide. High chlorophyll should appear red in these images, but the areas of intense blooms appeared bright yellow-green. This is because there is also a red pigment in the blooms that gives them their color. The third image is estimated chlorophyll. I used the ratio of band 146 (710 nm) over band 128 (665 nm) as a proxy for chlorophyll-a. Red and yellow indicate high chlorophyll, while dark blue indicates low chlorophyll. You can see that despite the red color, the algal bloom has plenty of chlorophyll. What about the third image? I used ENVI to run an unsupervised classification. This means that ENVI sorted the pixels in the image into five groups according to their spectral properties. I then used class statistics to obtain the spectral signature of each group. That’s the big image on the left of the slide. I repeated this procedure on seven images from the York River, four images from the James River, and one image from Mobjack Bay. The signatures in the York River were distinctive enough that we believe we are on the right track to find the spectral signature of Alexandrium monolatum. For my GIS 295 class project, I created an web app which shows the imagery and spectral signatures at each scene. If you are a member of Northern Virginia Community College GIS group, you can access the app here. Everyone else will have to wait until we are ready to make the app public. My classmate Sunil Bharuchi recently published a discussion of Tobler’s Law on his blog, GIS 295 Web GIS. 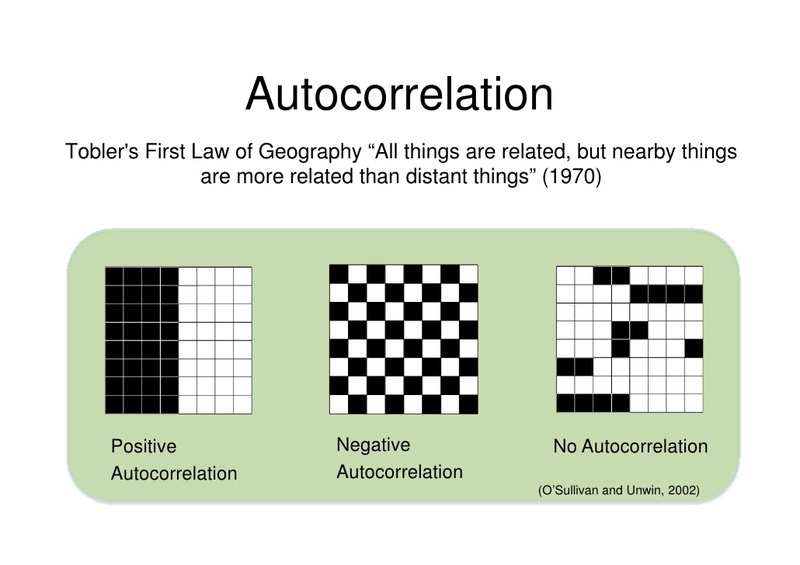 He included this image, which explains spatial auto correlation. Spatial autocorrelation measures how well a set of spatial features and their values are clustered together in space. A spatial feature is a point, line or polygon that identifies the geographic location of a real world object; this object could be a building, a forest, a rock unit or a lake. According to Tobler’s law, spatial features will be clustered next to more similar spatial features – this is illustrated in the first image above. But, is this always true? Sunil’s post got me thinking. Here is a geologic map of Yosemite National Park. Which of the images above does it look like? “Map of Yosemite National Park” by General_geologic_map_of_Yosemite_area.png: en:United States Geological Survey derivative work: Grandiose – This file was derived from General geologic map of Yosemite area.png: . Licensed under CC BY-SA 3.0 via Commons. I’ve spent years looking at geologic maps, so I told Sunil “image three looks more like geology.” But, does that mean Tobler is wrong? The Principle of Superposition: When sediments are deposited, the sediment that is deposited first is at the bottom while sediment that is deposited later is at the top. Therefore, the lower sediments are older. The Principle of Original Horizontality: Sediment is originally deposited in horizontal layers. The Principle of Original Continuity: Sediment is deposited in continuous sheets that only stop when they meet an obstacle or taper off because of distance from the source. Doesn’t the Principle of Original Horizontality sound a lot like Tobler’s Law? Then why don’t geological maps look like the first picture on Sunil’s image? First of all, sedimentary rock isn’t the only type of rock on Earth.Steno’s principles do not apply to igneous and metamorphic rock. Second, the Earth is an active planet. Plate tectonics causes sedimentary layers to bend, break and even overturn. Igneous rocks intrude into existing rock from below the Earth’s surface or erupt from above. These processes mean that geologic units are often very complex and the resulting spatial patterns reflect that complexity. “Yosemite USA” by GuyFrancis – Own work. Licensed under CC BY-SA 3.0 via Commons. James Hutton (1726-1997) was a Scottish physician and geologist who is known as the founder of modern geology. He was the first to suggest that the Earth is continually being formed and that based on the rates of geologic processes, the Earth must be much,much older than the accepted estimate of a few thousand years. He is also known for the Law of Cross-cutting Relationships. Law of Cross-cutting Relationships: If a fault or other body of rock cuts through another body of rock, then that intrusion must be younger in age than the rock that it cuts or displaces. It is this Law of Cross-cutting Relationships that helps us interpret geological units and create geological maps. Can you figure out the temporal relationships in this cross section? From Earth: Portrait of a Planet, 4th Edition (2011) by Stephen Marshak. So, how does Tobler’s Law fit in? It depends on scale. If you are standing on an outcrop of sandstone, chances are good that the rock surrounding you will also be sandstone – especially if you are in the tectonically quieter center of a continent. But, If you are mapping Yosemite park using one kilometer pixels, you will find a lot more variation in neighboring areas. This is a geologic map of Britain. It is a screen shot of the British Geologic Survey’s “Geology of Britain” viewer. I chose to show bedrock and surface geology because that’s what William Smith showed when he produced the first geologic map of Britain two hundred years ago in 1815. Unlike many of the English men who made great scientific contributions, William Smith was not nobility – or even well off. He was the son of a farmer. As a young man, he became an apprentice to a surveyor. He eventually went to work for the Somersetshire Coal Canal Company. While working in the mines, Smith noticed that individual layers of rock on the sides of the pit were always arranged in the same recognizable relative order. He also noticed that some layers were identifiable by the fossils they contained, and that these fossils were also always in a predictable order. He was inspired to see if the relationship between the layers of rock or strata, their positions and the fossils they contain was consistent throughout Britain. As William Smith studied the rocks of England, he drew cross-sections showing relationships and maps showing location. Eventually his work evolved into the first national geologic map. It measured 6 feet by 8.5 feet and showed the rocks of Britain at the a scale of 5 miles per inch. Smith’s map isn’t so different from the BGS map created using GPS units and satellite data. Two hundred years ago, one man created a map by walking through Britain. Since then, geologic maps have been created for every part of the Earth. Thanks to William Smith, mapping is an intergal part of the training of every geologist. As a geology student, I learned to map in the field by carefully measuring and plotting geologic contacts, folds and faults on a topographic base map. It wasn’t always easy to distinguish between the greyish-brown of one unit and the brownish-grey of another or determine my location based on map contours. Yet, I eventually learned to make a map that could be interpreted to tell the geologic history of a small area. William Smith didn’t have a topographic base map. How did he do it? Smith’s map is more than the distribution of rocks. It is a first edition volume of Britain’s geologic history. Since 1815, that volume has been edited and revised hundreds of times, but William Smith is remembered and honored as the original author. You learn more about William Smith and his maps and play with an interactive William Smith mapping app here. Take a look at the New York City skyline. It’s unique and recognizable because of its skyscrapers. New York City is home to some of the tallest buildings in the world. Suppose you are interested the height of skyscrapers in New York City. You could make a list of building heights, like this list from Wikipedia. This list tells me that the Empire State Building is the third tallest building in the City. It tells me that Freedom Tower is about 750 feet taller than the Chrysler Building. But, what does that look like? This gives me a much better idea of how building heights compare. But, this information is still limited. What if I want to know where these buildings are? What if I care about their locations? I will need a map. I used the Building Footprints shapefile from NY OpenData to create this map of buildings with a roof height over 500 feet tall in NYC. Only 177 out of 1,082,433 buildings in NYC are over 500 feet tall. Those buildings are indicated in red. Here’s a closer look: What is going on? Did New York City specifically zone these locations to have tall buildings? Is this meant to preserve the skyline? Or, is it intended to show the importance of the Financial District? The answers can also be found in a map. The location of New York’s skyscrapers is all about geology. As you can see in my hideously ugly geological map (colors courtesy of USGS’s New York Geological Map downloaded as a shapefile), the island of Manhattan has a different type of surface rock than the surrounding area. This bedrock is a metamorphic rock called the Manhattan schist (in pale lavender). The Manhattan schist formed more than 400 million years ago when a volcanic island arc (similar to today’s Japan) crashed into the eastern side of the continent of Laurentia forming a huge mountain range known as the Taconic Orogeny. The high temperatures and pressures associated with mountain building caused the clay minerals in the mud that accumulated of the coast of Laurentia to transform to more resistant minerals such as biotite, muscovite and quartz. Throughout most of Manhattan, this erosion-resistant bedrock is covered with large amounts of unconsolidated sediments. But, this exceptionally hard rock lies very close to the surface in Downtown and Midtown Manhattan. Because this rock is so strong, it makes the perfect foundation for a skyscraper. What about other cities? There are only two structures over 500 feet tall in Washington DC: the Hughes Memorial radio tower (761 ft) and the Washington Monument (555 ft). Why doesn’t Washington DC have tall skyscrapers? 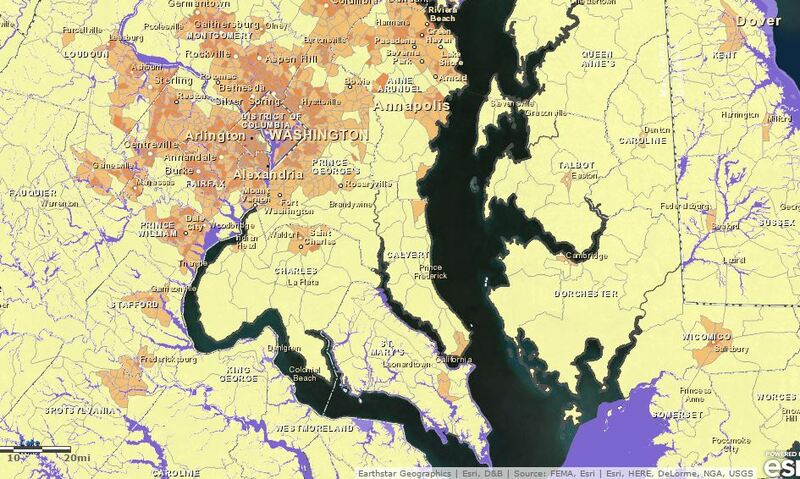 While there are some strong metamorphic rocks in Northwest DC, most of DC is built on much softer sedimentary rocks. These rocks cannot support a skyscraper. So, maps can help us understand where things are, but they can also help us understand why they are where they are. In New York, the height of a building depends on location and location depends on geology. This post was inspired by Episode 1 of Making North America on PBS. How many species are there on Earth? Nobody really knows, but one study estimated the number to be about 8.7 million and most of these species are insects. The largest group of insects are the beetles. Beetles make up about 40% of insects and 30% of animal life. Why are there so many beetles? Scientists used to believe that beetles had high rates of speciation, but a recent study co-authored by the awesome Dena Smith suggests that beetles might just be really good at avoiding extinction. You can read the paper here. This resistance to extinction means that many beetle species are very old. Species living now were around millions or even tens of millions of years ago. Beetle species don’t just live a long time, they are also fussy about where they live. They want the humidity and temperature in their homes to be just right. If it gets too hot or too wet or too cold, they move out and find another home. Long species durations and specific habitat requirements make fossil beetles very useful for learning about past climates, especially the Pleistocene. The Pleistocene Epoch is defined as the time period from about 2.6 million years ago to about 11,700 years ago. Like today, the Pleistocene was a period of rapid climate change. During this time there were between 20 and 30 glacial intervals where much of the world’s temperate zones were covered in ice. These glacial intervals were separated by warmer interglacial periods when the ice receded. 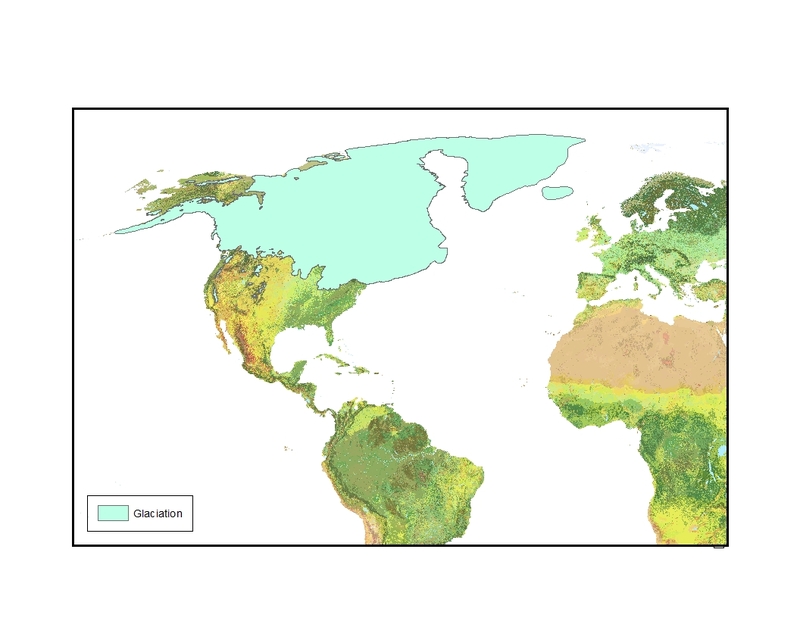 This map shows the Wisconsinan glaciation 18,000 years ago. 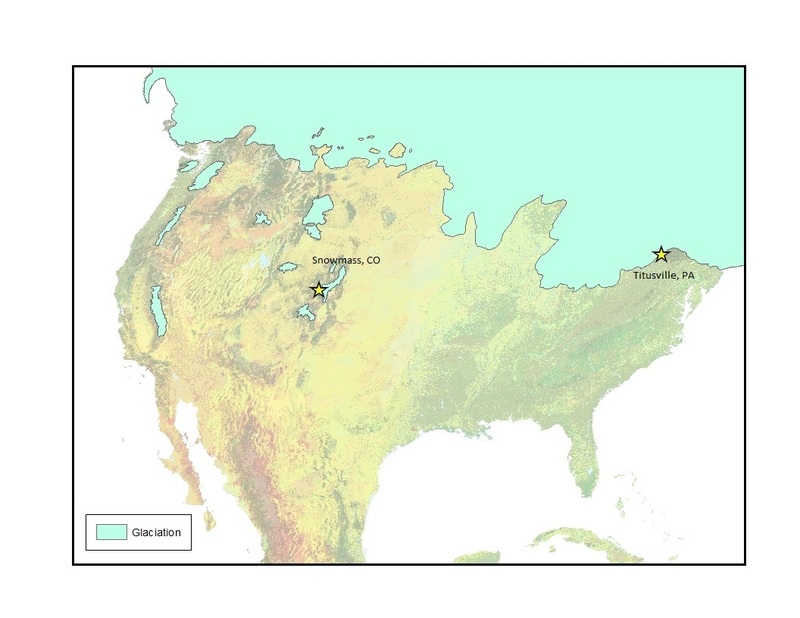 I wanted to see if I could use GIS techniques to reconstruct Pleistocene climate using fossil beetles. I chose two sites for my study: The Titusville Peat in Pennsylvania and Ziegler Reservoir near Snowmass, Colorado. The Titusville site is an ancient peat bog during the mid-Wisconsinan interstadial between 43.5 and 39 thousand years ago (Elias, 1999). Ziegler Reservoir is located near Snowmass Village, a ski resort in Colorado. In 2010, work began to widen the reservoir, but the remains of a mammoth were uncovered, leading to a paleontological excavation. Numerous mastodons, mammoths, ground sloths, bison and camels as well as insects were recovered from the site. Carbon dating indicates the age of the site ranges from 126 to 77 thousand years old (Elias, 2014). I obtained the list of species for Titusville from the Paleobiology database and the species from Snowmass from Elias’s 2014 paper about the site. I looked up species ranges using Global Biodiversity Information Facility (GBIF) and USGS’s Biodiversity Information Serving Our Nation (BISON) databases. These are sites that list museum specimens. Each record includes the longitude and latitude where the specimen was collected. 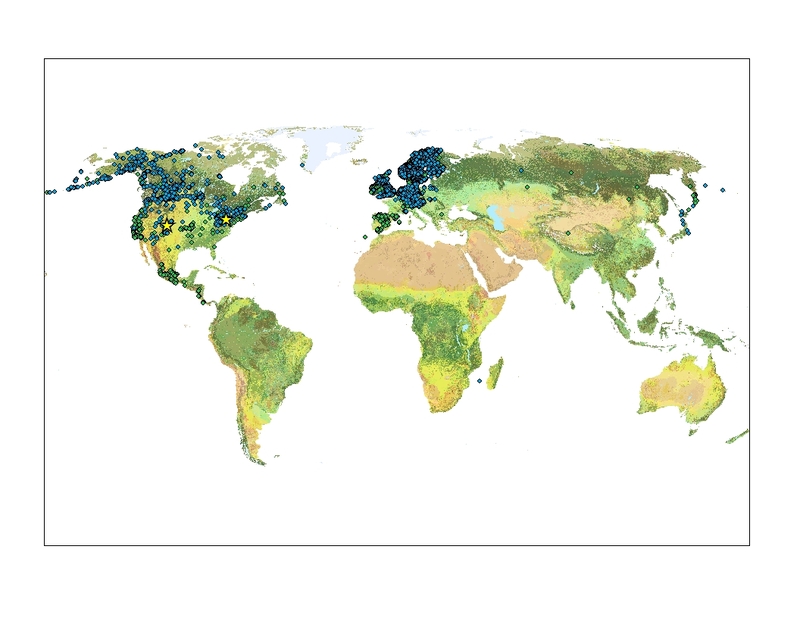 The global ecological land unit map was developed by esri and the USGS. 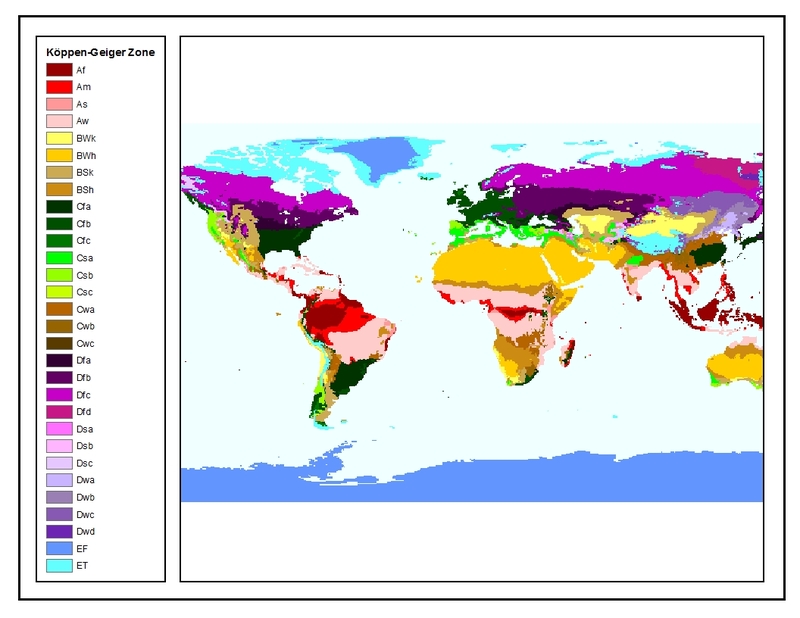 It is a 250 m resolution raster containing information about bioclimate, landcover, lithology, and landforms. Here are my fossil insect species on top of the global ELU map. The Koppen-Geiger climate classification was first developed in 1884. It has been revised several times, but remains the most widely used climate classification system. The system divides Earth climates into 30 zones with unique temperature, moisture and weather properties. I used GIS a sequence of spatial joins to connect the ecological and climate data to species. I learned that 43.5- 39,000 years ago, when the Titusville Peat was deposited, Titusville was in Köppen Geiger zone Dfc, which subarctic with cool summer, wet all year. This means that winter temperatures were as low as -40 C (-40F) and summer temperatures as high as 30 C (86F) — much cooler than current climate zone Dfb (humid continental). The bioclimate was cold and wet and the dominant vegetation included needle leaf /evergreen forests. The Snowmass data was more complicated because it represents almost 50,000 years and the site is on a mountain. On mountains, wind picks up flying insects from warmer, lower elevations and carries them to cooler, higher elevations in a process called orographic lifting. To compensate for the long time period and the effects of orographic lifting, I divided the beetle assemblage into five time intervals and I removed all the flying beetles from the analysis. The climate at the Snowmass site was initially similar to today’s climate. Insects suggest Koppen-Geiger Zone Dfc, subarctic with a cool summer.Over the next 2-3 intervals, the climate gradually cooled from Zone Dfc to to zone ET (tundra with no warm season). By the 4th interval, all insects indicated Koppen Geiger zone ET or tundra. But, in the last interval, the prevalence of insects from Zone Dfc indicates warming. As in Titusville, the bioclimate was cold and wet and the dominant vegetation included needle leaf /evergreen forests. You can see the modern distribution of Dfc and ET in this map. Using insects to model past ecosystems isn’t a new idea. But, as far as I know, no one else has used GIS to join insects to specific ecological variables for climate reconstruction. I will be presenting the more scientific version of this research at the Geological Society of America Annual Meeting in Baltimore on Tuesday, November 3. The assignment is take someone else’s map and modify it. I was assigned Asha Katti’s map of wildfire-prone areas in the U.S. Here is the link to Asha’s map. Asha is concerned with how wildfires affect people. The other layers on her map include 2014 USA population density and 2009 USA social vulnerability. Fires aren’t the only natural disasters that impact American lives. When the 1999 Loma Prieta earthquake struck the Bay Area, I was working at a social service agency in Berkeley. The earthquake left thousands of people homeless and jobless. I learned how easily a person’s life can be disrupted by an unexpected event. But, it doesn’t take an earthquake. It’s been three years since Hurricane Sandy. The category 2 storm flooded neighborhoods along the East Coast. The worst damage was in New York and New Jersey. And, people are still recovering from Sandy’s effects. 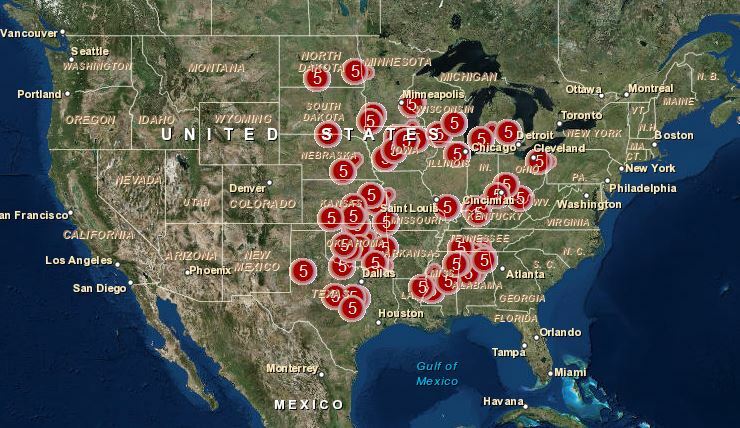 So, I amended the map to show the risk of all natural disasters that have a potential major impact on American lives: volcanoes, earthquakes, hurricanes, tsunamis,n floods, tornadoes and wildfires. Did I leave anything out? Zombie outbreak? This is Asha’s fire layer in Northern Virginia, where I live. Although we do have wildfire warning days in the summer, our overall risk of fire is low to very low (green and light green). While I haven’t experienced a wildfire in Virginia, flooding occurs regularly. The area in purple is the 100 year flood zone. This is the area that has a 1 percent chance of flooding in any given year. The yellows show population density. Floods in Virginia can be the results of hurricanes. We have a moderately high hurricane risk (orange). This is the same risk as New Jersey. The other severe weather threat that we worry about is tornadoes. However, we are less likely to have tornadoes in Virginia than in many other parts of the country. What about geological disasters? While we do have earthquakes in Virginia, our overall earthquake risk is very low, especially compared to earthquake risk on the West Coast. On the map, light areas indicate low risk while dark areas indicate high risk. This map of the West Coast shows earthquake and volcanoes. Volcanoes aren’t a risk in Virginia (or most of the United States), but there are active (red) and potentially active (blue) volcanoes in Washington, Oregon and Northern California. Recent earthquakes are shown as smaller dots. The red markings on the coast are tsunami risk areas. A natural disaster can change a life without any warning. So, how safe are you? The assignment is to identify two web maps and two static maps and determine the appropriateness of the medium for internet use. Geological maps often start as topographic maps. Topographic maps are available for download from the USGS. There is a fee for most of the maps. My Geology 111 students use the Fredericksburg quadrangle to practice their map skills. That map can be viewed here. You can see in the image below, that this is not an ideal map for the web. There is a lot of detail on this map, but I can’t see that detail on my monitor. The contours are barely visible. I ask my students to count contours to estimate change in elevation. This would be impossible if they had to do it on a laptop screen. When I was a student, I used topographic maps to make geologic maps – maps that show rock units. 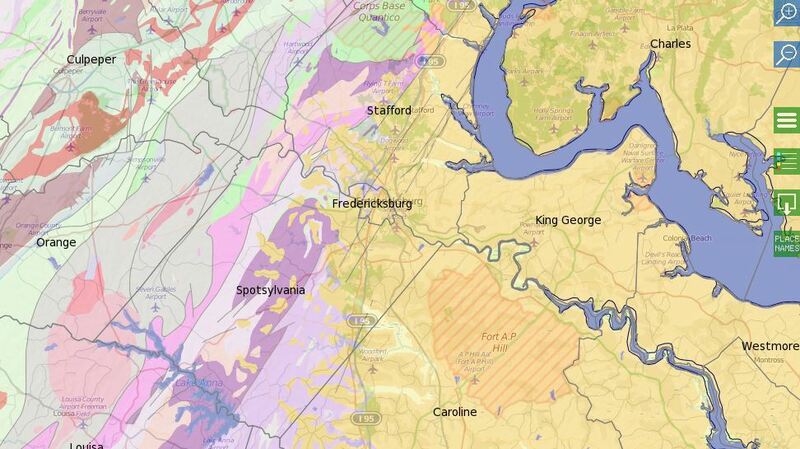 This is an image of a paper geologic map of Virginia stolen from VirginiaPlaces.org. I can see the entire map on my laptop screen. I can interpret and understand the information. But, it could be much, much better. The USGS has created an interactive geological map of the U.S. With this map, it is possible to zoom in to a state or county and see the geology of an area in increasing detail. This is the Fredericksburg area. I was able to add County names and information from Google Earth, so I could determine where the rocks are located. This is great and very easy to use, but it only shows one type of information. What if I want to know about rocks and climate? One of the benefits of using a computer to view maps is that multiple types of information can be stored and viewed on one map. 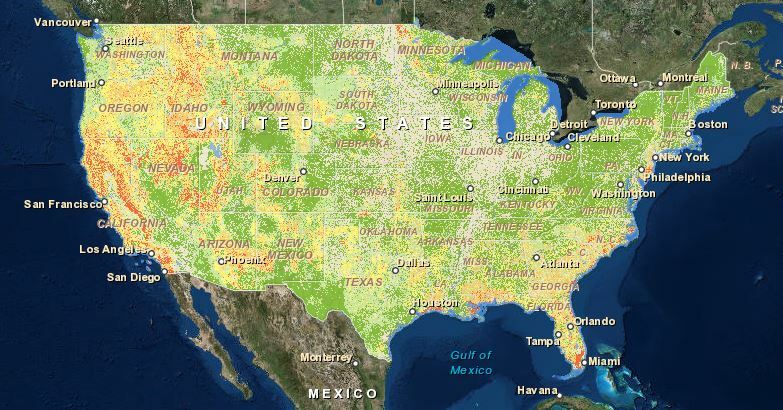 The USGS and esri worked together to create the “Ecological Tapestry of the World“. 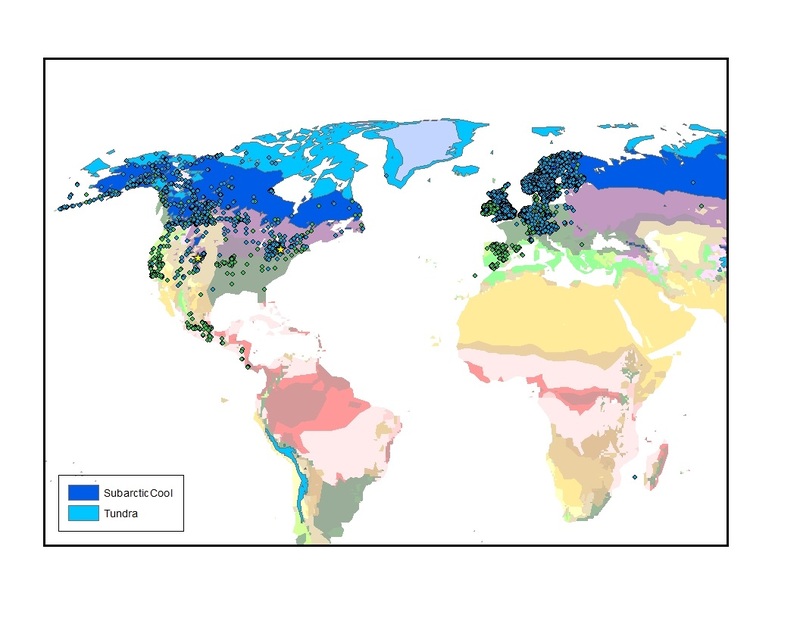 This interactive map shows rock type, but it also shows bioclimates, landforms,and land cover – all at a 250 meter resolution. The information is also available as a layer in ArcGIS online.